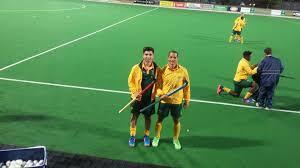 From second year student to up and coming national hockey star, Rusten Abrahams aims to leave his mark. Twenty-year-old Rusten Abrahams made his debut this week for the South African men’s outdoor hockey team as he was included in the squad to take on England and Germany in a summer series in Cape Town. Abrahams, a second year Bachelor of Health Sciences student, was called up to the team last week. In an interview with Wits Vuvuzela, Abrahams described how he felt when he got the call from head coach Fabian Gregory. The young midfielder said he was “overwhelmed with emotion” when he received the call and “felt honoured to be able to put on the green and gold uniform”. Abrahams said the demands of balancing university work and national team duties was something he had struggled with but he said he had a simple solution for coping with the added pressure. “I find that getting up an hour earlier each day just to get ahead of [my] workload is key to managing my sporting and academic life,” he said. The head coach of the Wits hockey first team, Ricky West, was full of praise for Abrahams. “He has a great work ethic in training and is streets ahead of other players his age when it comes to reading the game and making split second decisions in matches,” West said. West also said that Wits hockey as a whole was “in a good place, with the players buying into the professional nature of the set-up, both on and off the field”. The structure of the programme at Wits hockey allows players like Abrahams to make the transition from varsity level to a national team with greater ease, West said. The national team had yet to win a game in the series but Abrahams was still taking a lot out of the experience. “I’m enjoying the challenges in my path, and just digging deep, learning and just pushing through it,” he said.